Sophisticated investors are familiar with the various components of the precious metals complex gold, silver, platinum, and palladium. Palladium is generally the precious metal type that you hear and know least about these days. Understanding palladium is more important than ever now, because there are important correlations between the palladium and gold ratio and stock market prices. Right now the ratio of palladium to gold is sounding some warning bells for both the economy and the stock markets for those who know to listen. Though it is less popular and beloved by investors than gold is, palladium is actually a far better economic indicator. This is because palladium happens to be the most industrially used metal of the precious metals class. While the demand for palladium is overwhelmingly derived from industrial uses and sources at approximately 90% of its allocation, gold receives less than 10% of its demand from industrial applications. Palladium owes much of its popularity to emission controls. Though platinum is perhaps better known for its uses in catalytic converters, palladium has become the main emission control catalyst in vehicles using gasoline. This has a lot to do with the fact that palladium is less expensive than is platinum. Palladium is also widely used in electronics of all kinds because of its excellent conductivity and durability. The importance of palladium became more obvious after the end of the Great Recession. In a significant amount of the time following the after 2008 crisis years, palladium outperformed its cousins the other precious metals, all of which had strong performances. Strong and gradually increasing demand from China and other emerging markets drove palladium prices. Emissions controls became more common in gasoline vehicles and palladium continued to grow its market share of these controls and other electronics. The icing on the palladium cake turned out to be threatened and tight supplies from main palladium mining and producing countries Russia and South Africa. 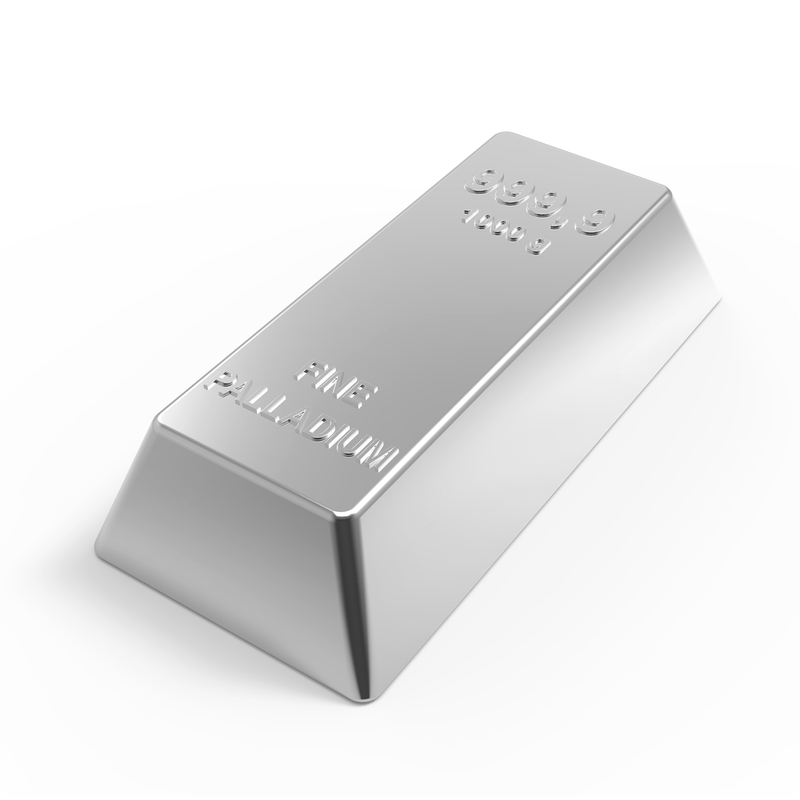 Many investors are aware of the silver to gold price ratio, but not so many are as familiar with the palladium to gold ratio. The silver-gold ratio has been counted as a leading economic indicator over the years. Palladium to gold prices are a more precise leading economic indicator. This is because the palladium to gold ratio turns out to be the more sensitive one where worldwide economic activity is concerned. This is true even though the ratio can be swayed by supply issues with palladium from time to time. As a prime example of palladium’s economic indicator role, consider palladium prices lately. They have been under pressure recently because worldwide vehicle sales for 2015 fell to just up 1.9%. This represents the smallest gain for vehicles since 2009, the year the recovery began in earnest. This issue has caused the palladium to gold ratio to plunge as a result. It matters for more reasons than how many vehicle sales are moving. What is a concern for stock market levels (and GDPs for that matter) is that the S&P 500 has seen some volatility increase in that time but not any consistent decline yet. The S&P today is right around where it was in March 2015 when it stood at 2,070. If the traditional relationship adjusts, the S&P could be headed significantly south. 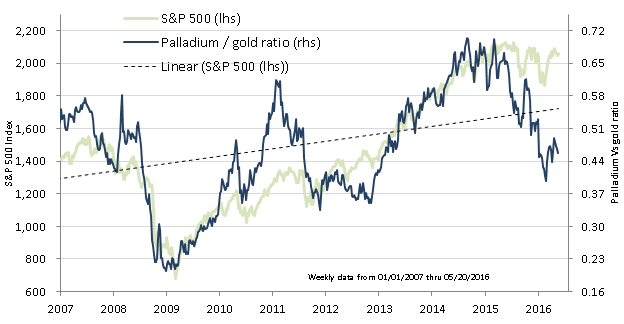 This lack of equilibrium between the palladium and gold ratio and the stock market represents one of two things. It is very possible that the S&P 500 levels are substantially overvalued and in for a significant and potentially deep correction. The other possibility is that palladium is cheaply priced compared to gold. Certainly the stock market and economy will have an uphill road to climb with the Fed threatening to begin multiple rate increases this year and next. Should the markets start that decline that the ratio is describing, falling palladium to gold prices will have been among the early warning signs. In either case, the precious metals like gold will likely benefit, either as the palladium to gold ratio goes back up or as economic decline and uncertainty materializes. This is among the many reasons why keeping a significant portion of your total holdings in gold and the precious metals has always made and continues to make good sense.